Home / Kohaku / Exceeded 30cm before Xmas! Had a little measure up today - a small sample from both grow on tanks, so I can gauge growth rates and see a few koi close up. The big news is - the early summer kohaku's are exceeding 30cm now. I pulled two up - one of the larger ones, which was 31.5cm, and one of the 9 fish I took to the All England show which is now 30.5cm. This is not one of my best 10, but is one of the larger ones - and measured in at 31.5cm today. I've mentioned this fish before, but can't find an earlier pic of it; it's one that was a 50/50 decision at each selection - the body has always been good, and the pattern ok, but the issue at each stage was the red - thickness, and consistency of the colour. I remember well at the second selection when it must have been 8cm at the most - and the red seemed washed out compared to the others, but I gave it the benefit of the doubt because the other traits looked good. 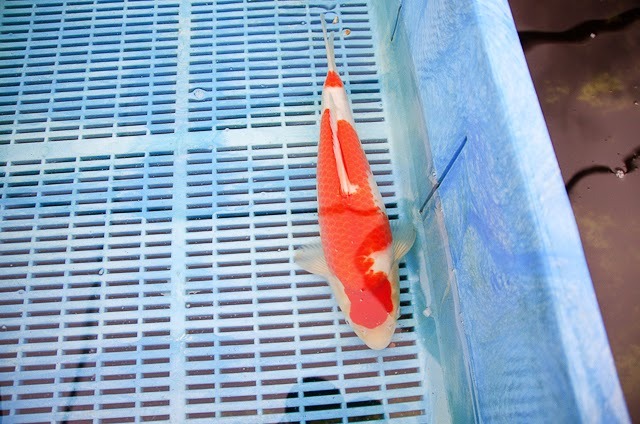 Thing is - there were other 8cm koi with similar red to this one, and most didnt work out well. But with this one, the red has only improved - and it's remained in the top few size wise. Could it be that the rapid growth of this one has masked the underlying quality of the red? 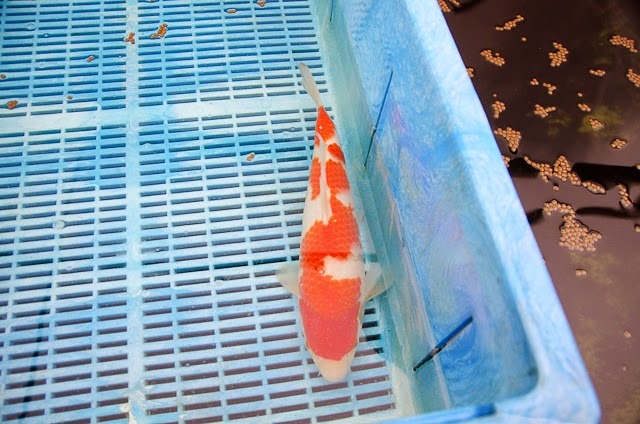 I can already see that this will be another 50.50 decision at the next selection - and it's still the red colour that this koi needs to sort out for me. The other big question is - how big is this going to be at the next selection point - at the end of March? Everything feels different about these fish now - even just the weight of the fish felt in the pan net. They're not so small anymore. I caught up a pan nets worth of early summer kohaku's - and they measured in at an average 15cm, ranging from 13cm to 17cm; and that pan net's worth looked representative of the others in the pond. I'm working flat out, which is likely to go on until the beginning of January. I'll have the second week in January off and hope to seine net the tanks and take a closer look and another measure up then.